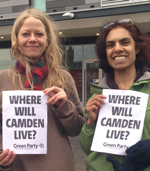 Sian Berry was elected to Camden Council with 1642 votes, representing Highgate ward. The seat was previously held by Green Cllr Maya de Souza. John Coughlin was elected to Lewisham Council with 1495 votes, representing Brockley ward. 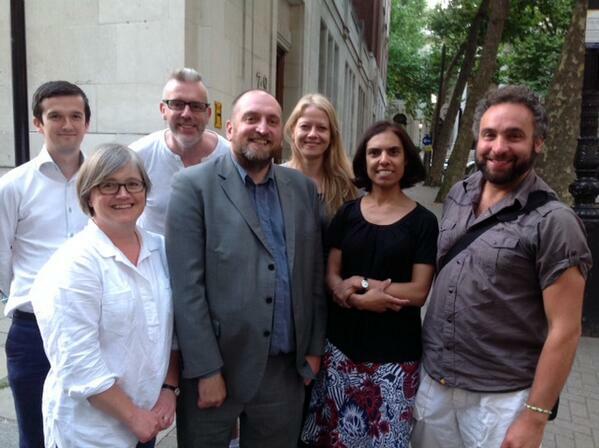 The seat was prevously help by Green Cllr and London Assembly member Darren Johnson. John is now the sole opposition voice on the Labour council. Scott Ainslie was elected to Lambeth Council with 1158 votes to represent St. Leonard's ward. After a recount Green candidate for St. Leonard's Jonathan Bartley narrowly missed out by a margin of only 57 votes. Caroline Russell was elected to Islington Council with 1214 votes, representing Highbury East - beating the Labour candidate by a margin of just 8 votes! Caroline is now the sole opposition voice on the Labour council. "We need to fix broken electoral system to give Londoners a voice"
The Greens are now celebrating their vote share in 4 of the city's boroughs where Greens came second only to Labour - beating the Conservatives, Lib Dems and UKIP. London Greens saw a rise in support of 50% compared with the 2010 local elections - with their vote share increasing from 4.6% 4 years ago to 6.9% in May 2014. In Islington Labour secured just 56% of the popular vote yet they now hold 98% of the seats, with the Greens the only party offering an alternative voice on the council. The Greens polled 2nd with 19% of the vote. 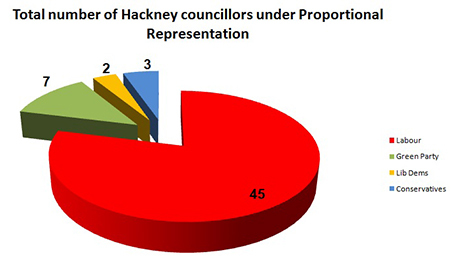 In Hackney (see left) one in five also voted Green - making them the 2nd most popular party - but the “first-past-the-post” system meant they were denied a single Green voice on the council. A similar story emerges in Lewisham (below) where the Green Party secured 16% of the vote but just one seat on an otherwise Labour council. In Lambeth, Greens came 2nd with 16% of the local council votes, but gained only 1 Green Councillor. The Conservatives, in third place with 15% of the vote elected 3 councillors.